Beginning in 2004, world oil production (total liquids) has been on a fluctuating plateau, as shown below. Hirsch’s warning that we’ve got at best 4 years before terminal decline is particularly disconcerting. It leaves us with barely time to brace for impact, let alone attempt to get out of the way. 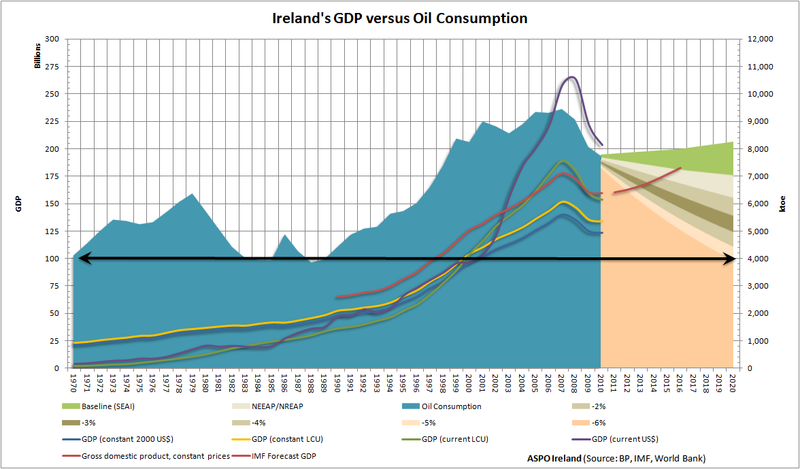 The Initial Thoughts article published yesterday took a high level look at Ireland’s oil consumption and looked at an illustrative scenario to halve consumption by 2020, effectively rolling us back to where we were in 1990. 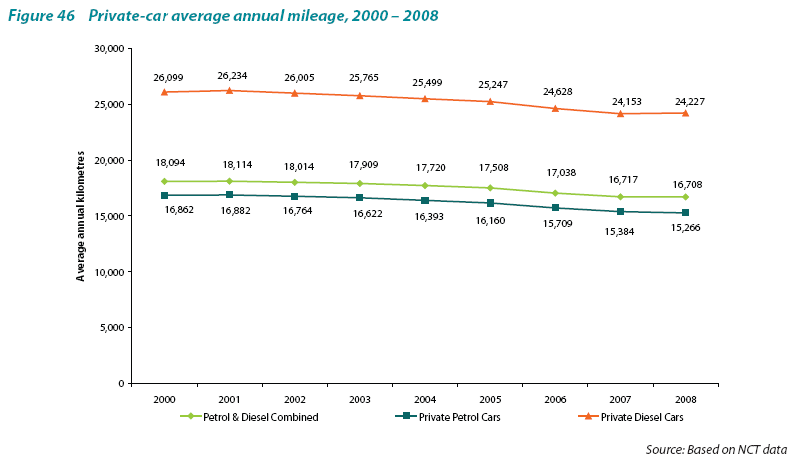 It was not possible without a drastic (2/3) reduction in private car use. The chart below extends the data back to 1970. 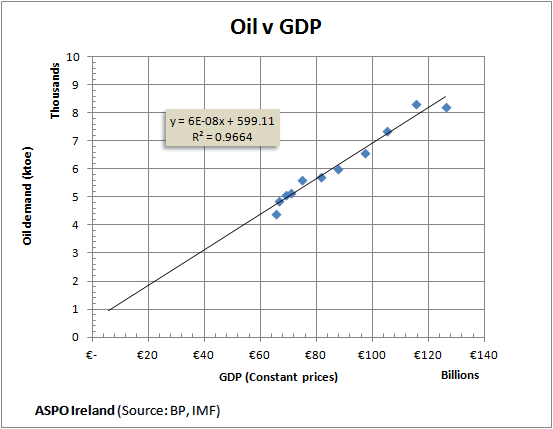 If this relationship holds on the way down, as it did on the way up, we should expect the economy to shrink back according to oil availability. Whether and to what extent this relationship works in reverse should be the focus of much considered attention. One important factor will be the cause of the reduction. If it’s because of high price imposed by market factors, then that could have a very different impact than if we implement policies ourselves to force us down the curve. 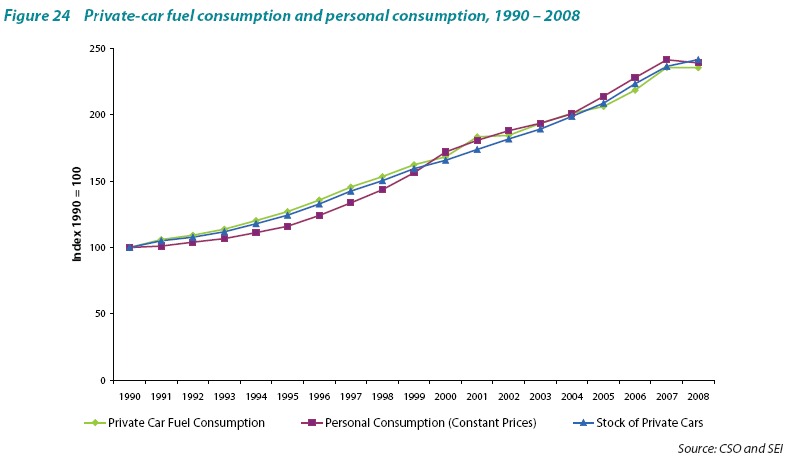 SEAI’s 2009 Transport Statistics report is a great resource, some highlights worth mentioning in this context include the chart below showing a strong link between personal consumption and private car travel. What’s interesting about the average distance data is how it demonstrates that our cars spend most of their time stationary. 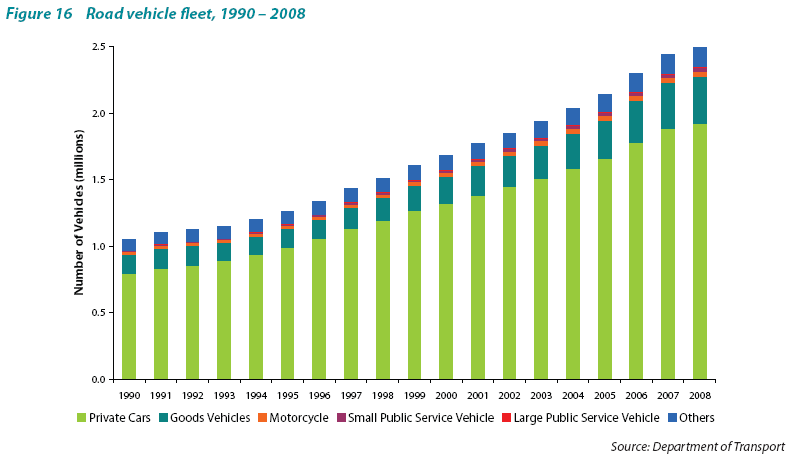 At an average speed of 30 kmph, it takes just over 500 hours to hit the average distance travelled by an Irish petrol car. Assuming normal driving hours are between 7am and 9pm (14 hours/day x 365 days = ~5,000 hours), the car spends 90% of its time going nowhere. 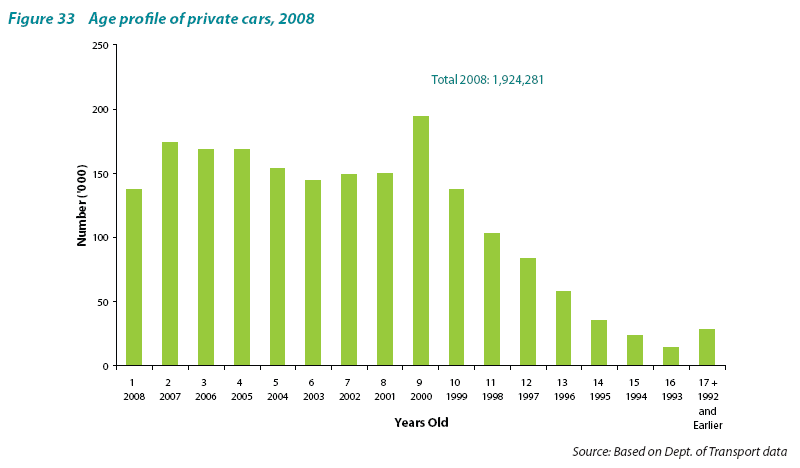 The vast majority of private cars are less than 10 years old, the average life of a car in Ireland is almost 7 years. 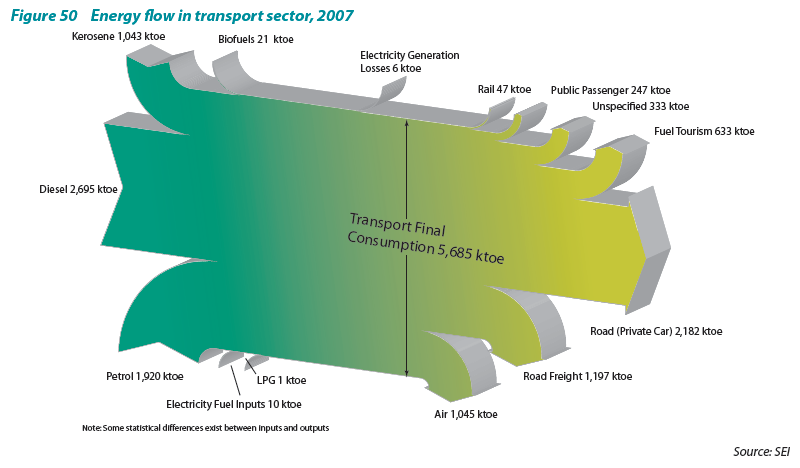 Even if we get back to the heady days of 100k new cars each year, and assuming petrol cars were outlawed, forcing everyone to buy electric, it would take 10 years to replace half the nearly 2 million private cars in Ireland (in the scenario being considered here, the remaining half needing oil will be recycled for parts). 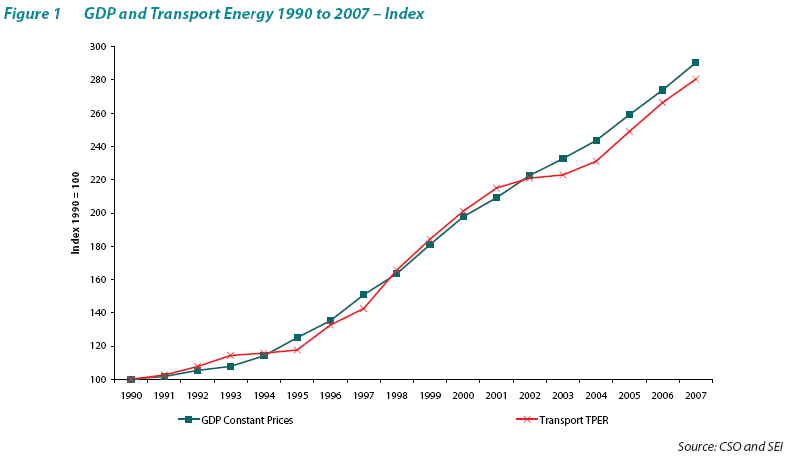 The chart below, extracted from a report by the CSO, presents a vivid image of those most vulnerable from a transport perspective to oil price volatility or availability. Finally, for the jet-set among us, it’s worthwhile to understand where most of our airline travel is destined. The link with the UK and EU clearly evident. 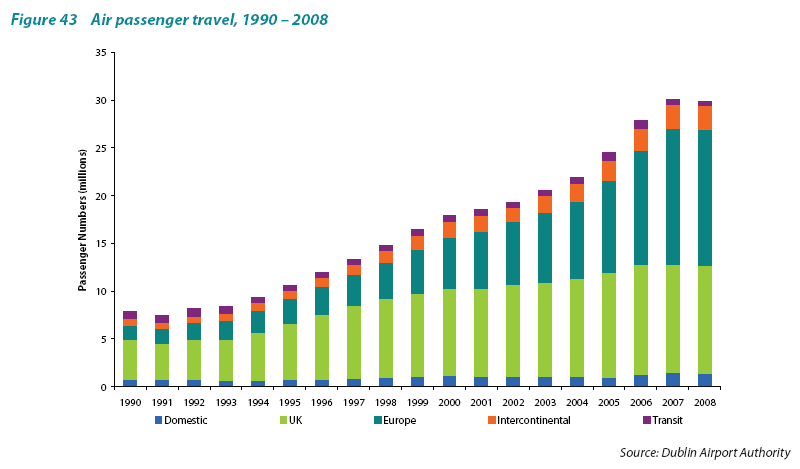 I don’t know if the data is available, but it would be useful to see a breakdown of this data into purpose of travel, business versus tourism. The government’s strategy of reinvigorating the economy through tourism may be misplaced.